When it comes to weddings I am often ask what are the rules, for the ceremony, reception, food etc… My answer is, there is tradition, things that people have done and continue to do over the years at weddings. But really there are no rules when it comes to a wedding. Your wedding day can be whatever you and your fiance want it to be. This is especially true when it comes to the food you serve on your wedding day, in particular the dessert you serve i.e. wedding cake. Side note: Though there are no rules there is etiquette for various aspects of a wedding, but that is a topic for another day. Okay, back to the wedding cake. People often feel they must have a wedding cake because every wedding they’ve been to has had one, their parents had one, their grandparents had one. So they must have one too. Well I am here to tell you, you don’t have to have a wedding cake. It is tradition to have a wedding cake, and that’s why most people have one. If you like some couples I know don’t like cake or prefer a different dessert then by all means go ahead and serve that. Here are a view examples of wedding cake alternatives you could have at your wedding. Pie, is the new cupcake. I if you’re not into cake or just want a great dessert to tie in with a rustic, or farm style wedding, pie is the way to go. I especially love mini pies. 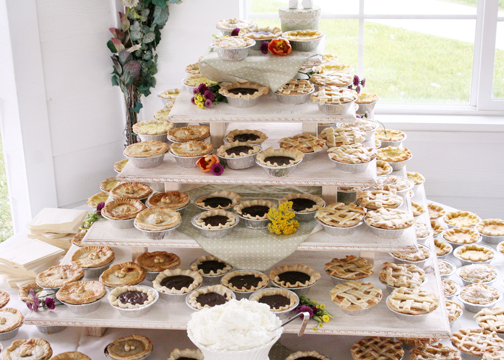 This allows your guest to get their own individual pie and try more than one flavor. Plus you can have a regular size pie to cut instead of cutting a wedding cake. Also, pie and ice cream is awesome! Donuts are another dessert trend that is becoming really popular at weddings. There are even companies that will come to your reception and make donuts to order for your guest. Who wouldn’t love a hot fresh bag of mini donuts to munch on ? 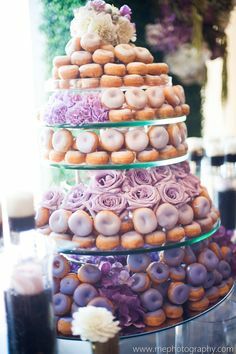 If you still want that dessert center piece look of a cake you can always have a donut tower. I think donuts are great for casual weddings, or for wedding brunches. They also make a great late night snack for wedding guest at the end of the night. If you are like me and all the dessert options sound good to you, you can always have a dessert buffet. Which is my favorite option because you can have a variety of different desserts to choose from, and the desserts are mini so you can have pie and donut hole or cupcake or all three. This gives your guest options and you can still have a small cake to cut for photos. 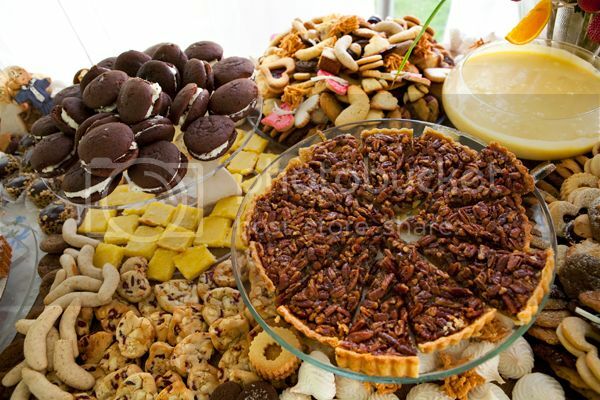 You can also serve cookies, brownies, cake pops the options are endless when it comes to wedding desserts. The moral of the story is there are no rules! If you don’t want a wedding cake don’t have one. It’s your wedding day serve whatever makes you happy, and what you would really want to eat. It’s fun and tasty way to express your individual style and taste on your big day.